The short slot hybrid is a four-port device, a form of quadrature coupler in waveguide. It provides an equal split, with outputs 90 degrees apart (quadrature). We are waiting for permission from IEEE to post some pictures of this component that we found in a 1963 article titled Semiconductor Switching and Limiting Using 3-dB Short-Slot (Hybrid) Couplers by V. J. Higgins. The original paper on the topic is by Henry J. Riblett, entitled The Short-Slot Hybrid Junction, published by the IRE in February 1952. 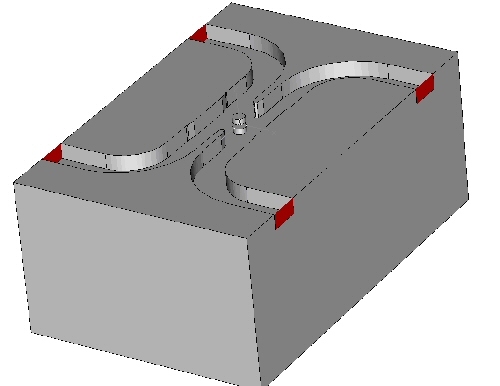 The basic construction of the short-slot coupler uses two rectangular waveguides that share a wall. Between then a single slot couples three dB (half) of the incident power from one guide into the second guide. The two resulting waves are 90 degrees out of phase (in quadrature). As is the case with most waveguide structures, it takes some tuning to get this puppy to work. It's a narrow-band device, with isolation of 20 dB over maybe 10% bandwidth. This example came to us from Dr. Paul Klasmann, who works at Q-Par Angus Ltd. 94 GHz is smack in the middle of W-band. If microwaves were audible, only a dog could hear this frequency! 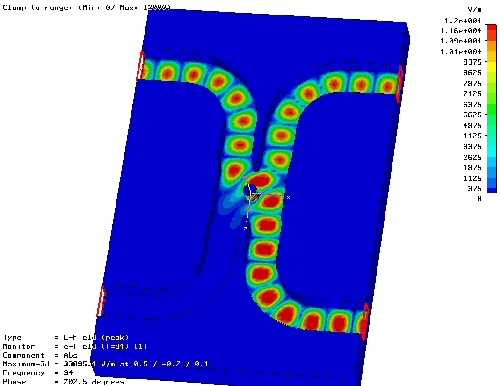 The plot below was taken from an electromagnetic simulator tool, showing E-field intensity within the coupler. The input port is on the lower right (where the E-field is seen to be strongest). The "through" port is on the upper right and the quadrature (90 degree) output is on the upper left. The two output ports are of equal intensity indicating that a 3 dB split has been achieved. Note the absence of a discernible E-field at the isolated port (lower left). We regret that prior to April 9, 2008 the input/output ports were designated incorrectly in this paragraph, but they are correct now. The figure below shows the bottom half of the waveguide block with the ports numbered 1 to 4 anticlockwise starting at the bottom right. Note to readers: you have to be very careful when you split a waveguide assembly this way, the braze joints have to be perfect or the E-field won't see the ideal short circuit it needs at the short wall. In this case the coupler block is split at the top of the short wall so that there's no discontinuity in the region of peak current (at the middle of the short wall). The two posts you see inside the slot are tuning slugs. S-parameter prediction is shown below. 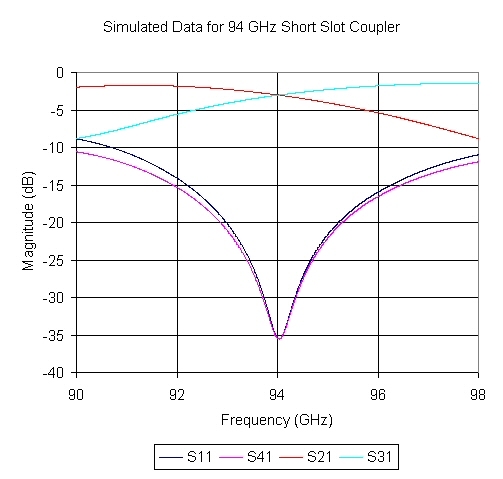 From this you can get an idea of the useful bandwidth of the short-sot coupler, it should be considered for relatively narrow band applications only. However, at 94 GHz, 1% bandwidth is about one GHz wide! Here's a photo of the completed assembly. Click on the image for a higher resolution image! Initial measurements, further adjustment of stubs are required to improve the isolation and amplitude balance. 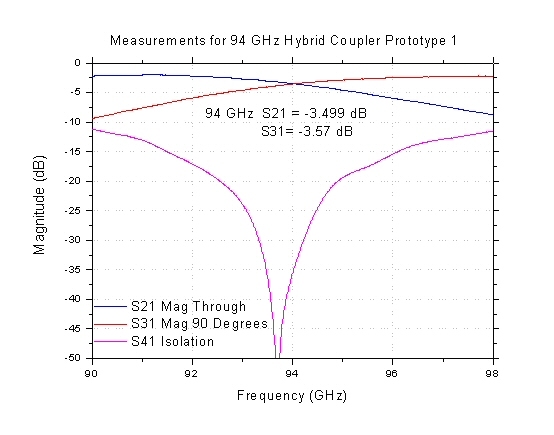 Ideally both outputs should be at -3.01 dB but there is around 0.5 dB "real" insertion loss (S21 and S31 are ~-3.5 dB). Phase between outputs should ideally be 90 degrees. 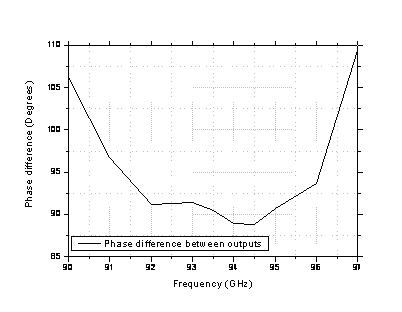 The measurement below shows that this has been achieved at the center frequency. 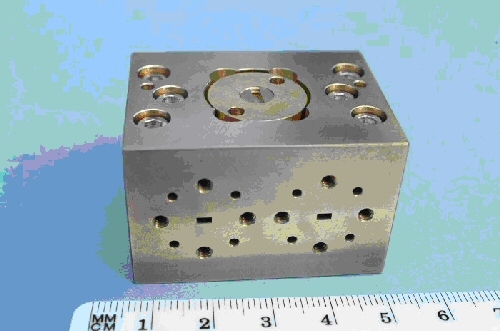 If you get in touch with Q-Par Angus about this coupler or other millimeterwave products, tell them they should cough up some dinero and sponsor this page!